# The bootstrap command is an extremely powerful command that resamples from you sampling distribution in order to estimate a standard error for an estimator. 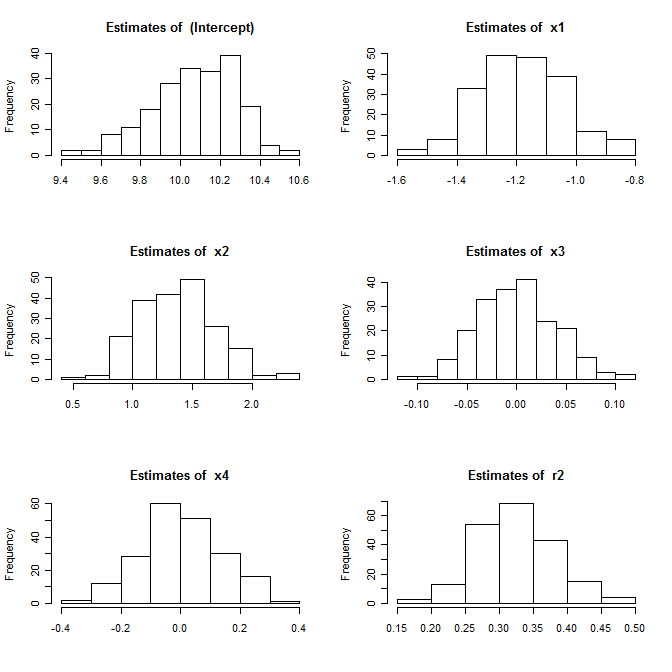 Often, using the bootstrap resampling technique can yeild estimates of standard errors on estimators that are otherwise extremely difficult to estimate (using the Delta method, the predominant method for estimating standard errors for non-linear functions). # This post will develop a simple function that takes a data source and an estimator and generates standard errors. # First let's simulate some data. # A simple OLS regression will generate good standard errors. # We can see that x2 has a standard deviation of about twice that of x1, this is due to x2 having half the standard deviation of x1. 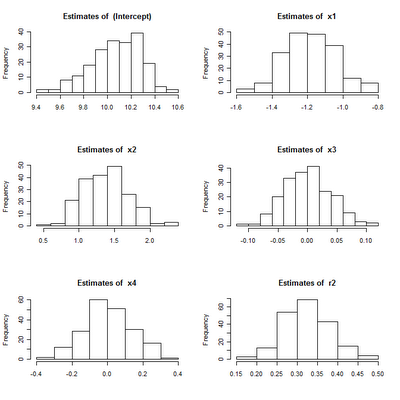 # As a check, let's say we would like to estimate the standard deviation of our coefficients using bootstrapping instead. # Note, the length of our original.est is the number of coefficients we will estimate standard errors for. # Now we should have a new data frame called draw which has nobs draws. Observing draw it should be easy to see there there are some observations which are repeated. # We have completed our bootstrap rountine. Now we need only perform whatever statistics we want on the results. # The key is that we need the function to return a vector to the boostrap command. Thus the subscript [] restricts the returned values to only be the estimates. 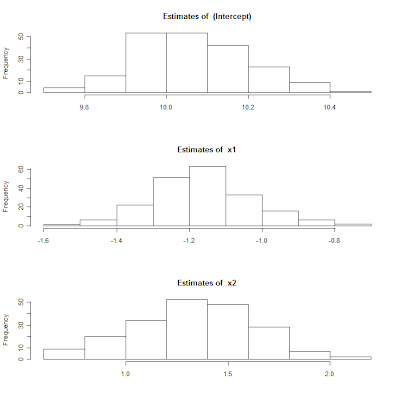 It my take some manipulation to get a single vector out of an estimate. 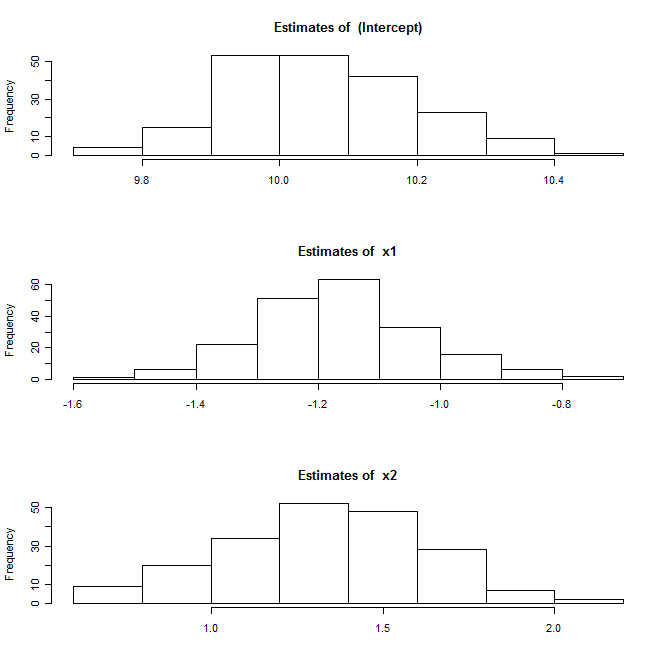 # We can see that the standard deviation of our bootstrap estimates are similar to those of our linear model. We can see that we are able to estimate not only standard coefficients but also the standard deviation of any estimator generated from sampling. The extreme draws in r2 is probably due to some of the sampling distributions having very low values (or high values) of the error term by chance in those extreme draws.